We have two practitioners at The Bunker which means we are capable of delivering the course up to 50 individuals.The Bunker offers bespoke workshops tailored to suit the requirements and overall goals of an organisation. All staff can work to a given brief to deliver the workshop that you desire. We can also help write and form a workshop around an idea that an organisation has in mind. At The Bunker we offer participants the chance to gain first hand knowledge of the music industry regardless of their backgrounds or musical experience. 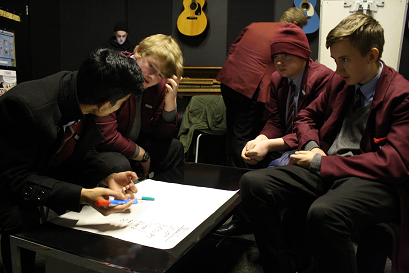 Participants will have the chance to take part in music workshops spread across the music spectrum. Not only will individuals be able to join in and take part in music workshops but they will also be able to work alongside art practitioners and musicians gaining hands on experience and knowledge of the various sides of the industry. Volunteering options are always available and we welcome all who seek to help out and gain experience working in the music industry. The Bunker is here to inspire individuals and make their experience of the music world as positive and engaging as possible. The Bunker C.I.C has now been made an official Arts Award Supporter and has currently educated many individuals on several levels of the Arts Award itself; starting with. Arts Award Discover: The Arts Award Discover course is currently offered as introductory award into the Arts Award criteria, this course is currently aimed at those aged 5-9 and will offer a chance to connect with music in given workshops as well as be close to practitioners to inspire and encourage musical interest. Arts Award Explore: The Arts Award Explore course is an Entry Level 3 Award into the Arts Award criteria, this course is currently aimed at those aged 7-11 which will involve a further in depth chance to connect with the arts and their practitioners this will involve creating music and inspiring and nurturing the individuals, their musical interests and goals. Bronze Arts Award: The Arts Award Bronze course is a Level 1 Award in the Arts Award criteria, this course is currently aimed at those aged 11-14, this being an award that is beyond the entry level of discover and explore, the individuals on the course will have a chance to get further in depth with music as a subject by being involved in various workshops as well as having a chance to take part in an event and learn about the history of music and why the study is so important. Silver Award: The Arts Award Silver course is a Level 2 Award in the Arts Award criteria, this course is currently aimed at those aged 14-16, this being the level 2 award, the individuals on the course will have the opportunity to complete a challenge relating to the art of music as well as have a chance to learn about music events, possible careers as well as be tasked with a leadership project to which they can showcase their knowledge. The Arts Award Journey and all of the courses that have been mentioned are open to anyone up to the age of 25.